A couple of weeks ago, we were at a friend’s home one Saturday evening. There were a handful of adults, and a handful of kids as well – a pretty good mix. For food, my friend echoed the company he had over. The main course was a variety of delicious sub sandwiches and a big tray of appetizers, consisting mostly of fresh fruits. There were grapes, there was mango, there was pineapple, and there were pomegranate seeds. I was particularly intrigued by the pomegranate seeds. They were almost sweet, ever so crunchy, and completely delightful. Vaguely familiar with the ancient fruit from which these seeds were derived, I wanted to learn more about them and at the insistence of our 10 year old son Ike, who fell in love with their taste, I have been buying them on a regular basis since that night. Fast forward a few weeks from that night at our friends, when two days ago I received this iMessage from my sister, Chef Kathy, which had an almost urgent tone to it. It stated simply: “Look @NYT article on pomegranate & candied ginger bark.” My sister is infinitely more creative than I am and when she suggests something like this, 9 times out of 10 I will take heed and follow her lead. I’m especially happy I did, in this case. I put these holiday-centered treats together in a snap. Not having any candied ginger on hand, I instead slipped some fresh ginger root into my small food processor and added a touch of pure maple syrup to balance the hot zing of the fresh ginger. Similarly, I did not have bittersweet chocolate on hand but instead both unsweetened and semisweet baking chocolate. Long story short, I made do with what I had and the result was nothing less than completely delightful. What follows is essentially the recipe that I found for this treat but don’t be afraid to improvise to what you have on hand, and to your taste. You will love these, as will your family and guests. Put the chocolate in a wide, shallow microwave-safe bowl and microwave on high until it just starts to melt, about 1 minute. Stir with a spatula until the chocolate is completely melted and smooth, heating in additional 15-second increments, if necessary. Gently stir most of the pomegranate seeds (reserve a tablespoon or so), and the ginger (break up any clumps with your fingers), into the chocolate. Scrape the chocolate mixture onto the baking sheet and spread it into an 8x10-inch rectangle. 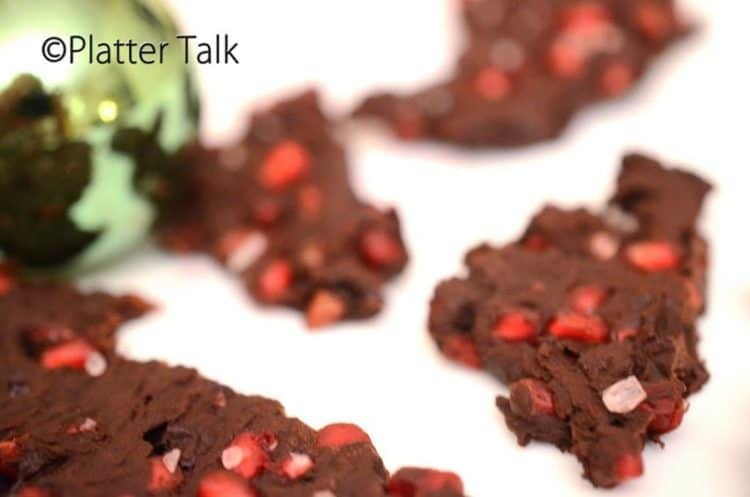 Sprinkle the remaining pomegranate seeds, along with the sea salt, evenly over the top, pressing them into the chocolate. refrigerate until fully set, about 30 minutes. Break the bark into chunks with your hands (be careful not to crush the seeds), and serve. You can melt the chocolate using a double boiler, which is what I did. 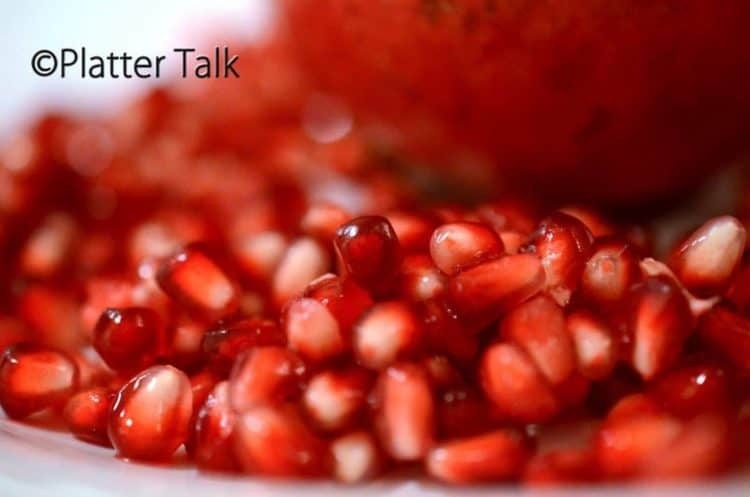 Use the back of a tablespoon to spread the bark and press the reserved pomegranate seeds into the bark. This sounds so good! The pomegranate is so pretty speckled in there and the warm ginger is a perfect touch as well. Bark is a favorite holiday treat of mine and I’d love to try yours! 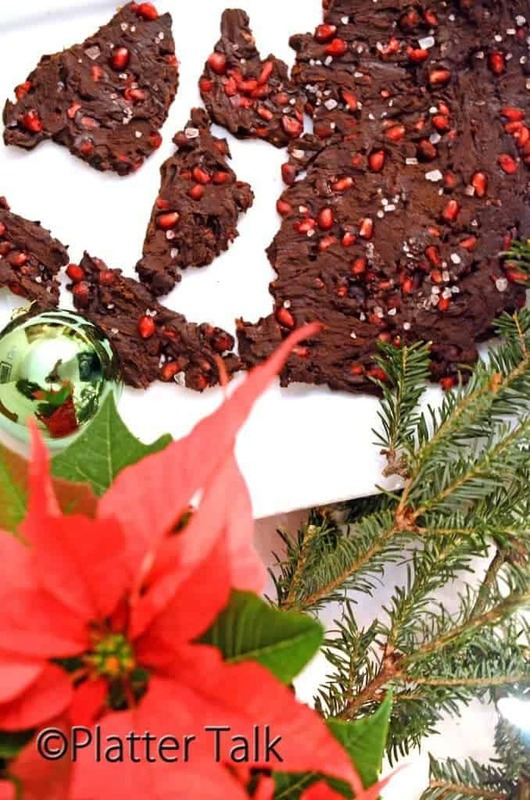 This chocolate pomegranate ginger bark looks delicious perfect homemade gift idea for holidays. I love that you used fresh pomegranate. Ooh that bark looks so festive. Love the addition of fresh pomegranate seeds in here. Candied ginger must have added so much flavor. This is such a great holiday idea! Love that touch of red with the chocolate and then the ginger flavor — WOW!! I’m searching for unusual Christmas gift ideas for gift giving. This would look gorgeous in my Christmas dessert gift box. I love ginger and chocolate – and just saw fresh pomegranates in the store the other day. What a perfect treat for this time of year! Oh, the combination of chocolate and ginger sounds perfect. My family will definitely be delighted with this snack. Looks very nice and tasty and I add your recipe to my favorite. Love the fresh pomegranate in this! I wonder how long this bark would keep? I love making bark but I have never tried it with pomegranate. This looks so good. The color is precious. I absolutely the combination of ginger and chocolate. This looks so delicious and so festive. I love the freshness of pomegranate in chocolate. This would be perfect for wrapping in gift too. With the holiday baking just around the corner, this would be a great addition to any sweet tray. Also this would be a great food gift. Any hostess would welcome this at their party. I can totally see how perfect this is to give to all my husbands associates as a gift in tins, Its so festive and I love bark! What a beautiful holiday treat! I love the colors and I bet the flavors are fantastic. Yum! Looks amazing! I found a recipe for making candied ginger recently! I think I’ll make some and then make some of these beauties! Thanks so much, Beth. I know you’ll enjoy this one! This looks great! And they say that dark chocolate is healthy. And so is pomegranate. So, that makes this health food! Which means I can eat as much as I want! YUM! Love the addition of ginger and pomegranate, looks so festive! I have two frwsh pomegranates and I definitely should make this. Wow! Thanks to Chef Kathy for the tip and to YOU for the great recipe! Cannot wait to try this, Dan. As always, you are aces in my book. Thanks for sharing! Thanks, Stacy – this is a fun and easy holiday treat; who can reisit just a small piece of bark? 🙂 Hope your holiday season is filled with joy! Improvisation leads to the best comedy sketches. 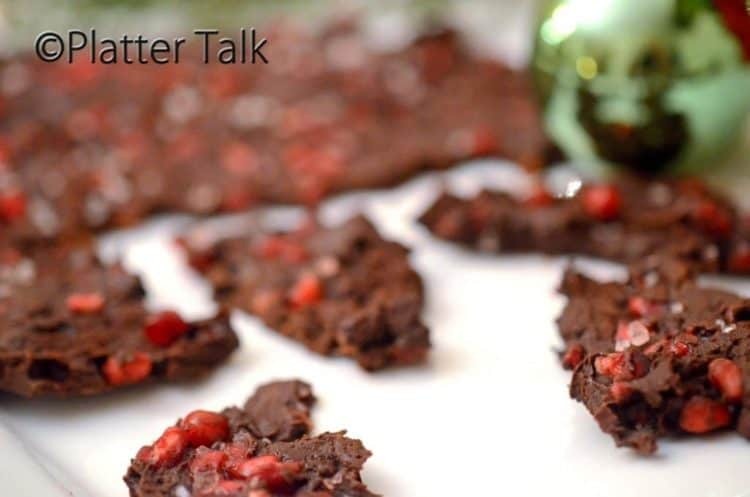 Similarly, your use of on-hand ingredients led to this Chocolate-Pomegranate-Ginger Bark gem. I applaud the versatility of it, and I like your thought to temper the ginger with honey. I’m sweet on this, Dan. Thanks for sharing the recipe. 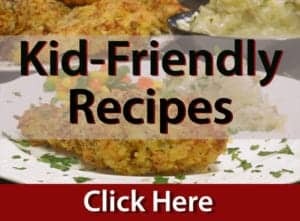 Thanks for you comments, it’s always fun to come up with a new twist on recipes; particularly when the outcome is a good one! I appreciate hearing from you, as always! I eat pom arils like candy! So it totally makes sense to me to incorporate it into candy. This looks great! I’m quickly becoming addicted to these glowing seeds of goodness, myself. I can’t imagine anything with which they would not pair well! The combination of flavors must be incredible! Thanks! Thanks, you are spot on – the flavor profile of this is both festive and delightful. Many thanks, again for your kind comments! Thanks for the comments, this was a fun and easy holiday treat to put together! Dan, your bark looks great! The sea salt is a lovely addition. Nice festive styling too. Thanks for dropping by, I really appreciate hearing from you! What a beauty Dan! 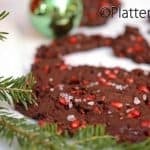 Love the idea of pomegranate and ginger in a chocolate bark. Deeeelish! 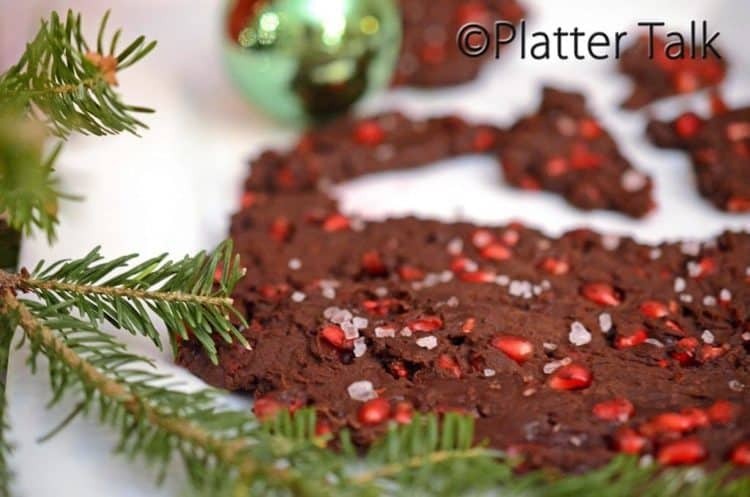 Never occurred to me to mix pomegranate seeds in with a chocolate bark! 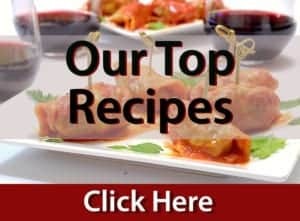 Outstanding recipe – something I definitely want to try sometime. Thanks for the comments, this is a different but pleasing taste combination. It has holiday written all over it! Great idea your sister had!! Indeed! Thanks for the comment, hope you are staying warm!! I do a white chocolate, ginger, macademia nut and raspberry cranberry bark. This does sound very interesting!